The World Steel Association (worldsteel) today released its October 2018 Short Range Outlook (SRO). worldsteel projects global steel demand will reach 1,657.9 Mt in 2018, an increase of 3.9%* (please see *note below) over 2017. 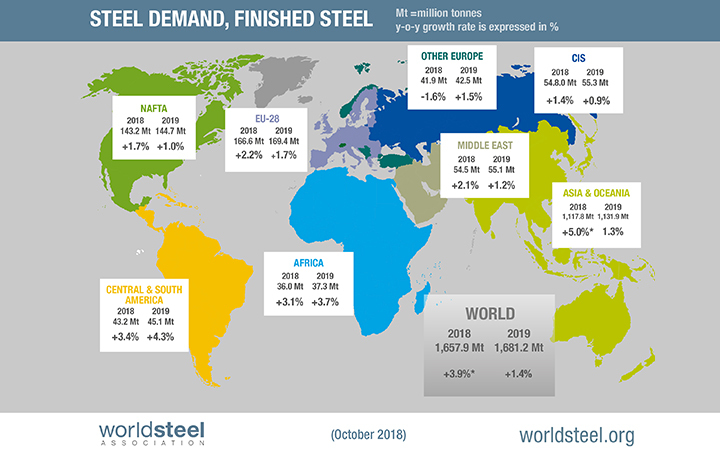 In 2019, it is forecast that global steel demand will grow by 1.4% to reach 1,681.2 Mt. In the first half of 2018, Chinese steel demand got a boost from the mini-stimulus in real estate and the strong global economy. However, continued economic rebalancing efforts and toughening environmental regulations will lead to deceleration of steel demand toward the end of 2018 and 2019.